William "Bill" Foley II, the great-great-nephew of Texas Ranger, cattle herder and "father of the Texas Panhandle" Charles Goodnight, has followed in his pioneering uncle's footsteps. A consummate entrepreneur, Foley is the ex-chairman of a Fortune 500 company, owner of a working cattle ranch and golf resort in Montana and founder of Foley Family Wines, where he began his foray into the wine and spirits industry. Taking full advantage of his creativity and connections (Foley spoke at length with Wild Turkey to find the perfect recipe for his whiskey), Foley has been working tirelessly over the past several years preparing to launch his newest product: Charles Goodnight Kentucky Straight Bourbon, a nod to his late ancestor. 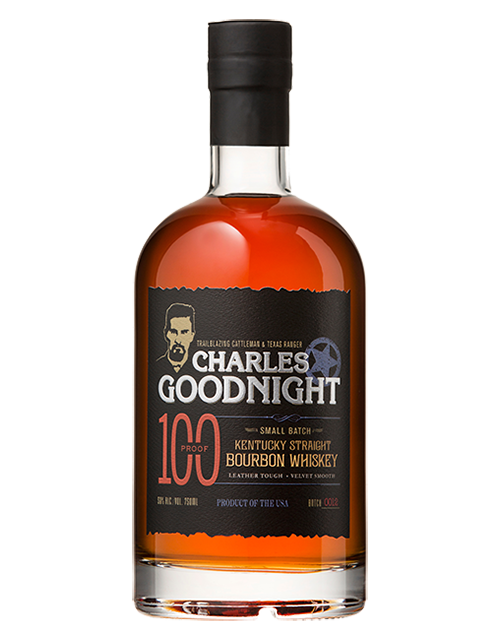 Charles Goodnight Kentucky Straight Bourbon is aged for roughly six years and bottled at a robust 100 proof. "My great-great-uncle was a tough guy and a big bourbon drinker," says Foley. "He wouldn't have wanted an 80-proof bourbon." Charles Goodnight Kentucky... For Whiskey to be considered a Bourbon, it must be distilled from at least 51% corn and it must be aged in new, charred oak barrels. Bourbon must be no more than 160 proof, but we prefer to do things like they used to and bottle at an honest 100 proof. Lastly, Bourbon must be aged at least two years without additives of any kind. Goodnight Bourbon is made from the finest offerings of corn, rye and barley malt. Pure water straight from the Kentucky River is used to cook the grains during the mashing and malting stages. It’s the malt that converts the grains starch into those glorious sugars needed for distillation. The sugar-laden mash is then pumped into fermentation vessels where the yeast is added. Yeast, known by us as “distiller’s gold,” is what gives our Bourbon its deep amber hues and fragrant notes. We then transfer the mash to a continuous still where it is vaporized at a high temperature, turned back into liquid, and distilled all over again. This creates a succulent mouth-feel without compromising great flavor. After distillation, we age Goodnight Bourbon in charred, new American oak barrels. That charcoal coating on the inside of our barrels creates those sweet caramel notes and steady spice. We shoot for the highest levels of char possible to get the biggest flavors. Once the barrels are filled, we tuck them away in the rickhouse for six long years. During that time, the spirit develops its bold flavors and a color the likes of warm auburn. When the flavors are just right, we craft a specialty, small batch blend from a number of hand-selected barrels. Finally, the Bourbon is finished through a filtration system and put into bottles, ready for drinking.